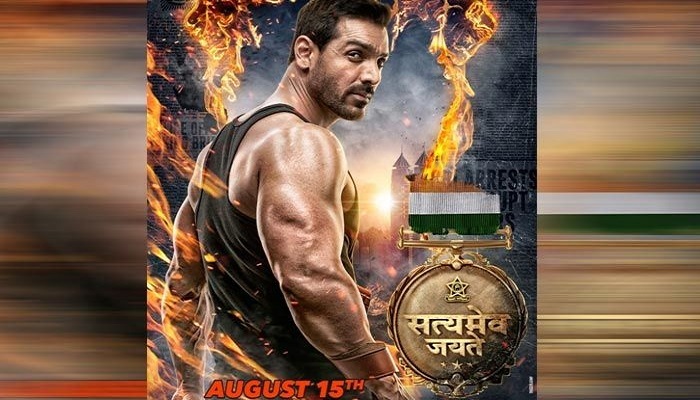 The much-awaited trailer of the John Abraham- starrer ‘Satyamev Jayate’ is finally out and is at its interesting best. Substantial performances, boosting background score, strong visuals, and charisma of John made the trailer high-powered. In the trailer, we can see the Parmanu actor delivering vigilante justice with brutish force. The trailer opens with the power packed dialogue “Sach mein achhe din aagaye”. John is seen in the middle of a monologue that compares the menace of corruption to religious violence. The intriguing trailer also shows Manoj Bajpayee in the role of a cop, who is on a mission to find the vigilante who acts according to his own code and thinks of himself as the savior of the country. Needless to say, John Abraham’s fight against corruption will restore your faith in justice. The trailer is winning the hearts on the social media with netizens going gaga over it. While lauding the trailer, one of the Twitter users tweeted, “After Watching #SatyamevaJayateTrailer I Can Say This Is Gonna Be A Blockbuster Movie…Superbly Written And Very Well Executed Dialogues, Power Packed Action #JohnAbraham. Written and directed by Milap Milan Zaveri of ‘Kaante’ fame, the film is scheduled to hit the theaters on August 15. It is likely to clash with Akshay Kumar’s ‘Gold’ and Kangana Ranaut’s ‘Manikarnika’. Next Next post: Netflix’s Scared Games is in trouble. Congress Man Files Complaint.